EPCOT is known as the Experimental Prototype City of Tomorrow, but during the holidays it might as well be called Extremely Picturesque Christmas of Topiaries. Yes, TMSM readers, EPCOT is THE place to go if you want your Christmas cards to feature perfectly landscaped topiaries in the shapes of Disney’s most memorable and iconic characters. For those who have never heard of the term topiary, it is the art or practice of clipping shrubs or trees into ornamental shapes. Let me tell you, these amazing shrubs are most definitely works of art. TMSM recently featured pictures of some of the holiday décor that you will find when you visit EPCOT. So make sure to check that out on social media, and get a head start planning the perfect picture spot. Now, let’s get to the good stuff. You won’t have to go far for the first location that’s Christmas card worthy. Right as you enter EPCOT, lodged between the Leave a Legacy walls is your first photo opportunity. Almost a 360 degree opportunity; let me explain. This location is what the EPCOT map refers to as ‘Epcot Main Entrance Picture Spot’. Here you will find Mickey and Minnie wearing Santa hats with their furrr-ever friend Pluto, whose probably just buried a succulent bone stolen from a World Showcase kiosk. Pluto’s doghouse is decked out in colorful Christmas lights. This spot is wonderful to get great coverage of Spaceship Earth in the background. Walk to the left and you’ll find a Bambi topiary. Choose the right, and find Thumper and Flower. If you trek a little further right before the fountain and turn back towards the monorail there is more than meets the eye. Surprise! 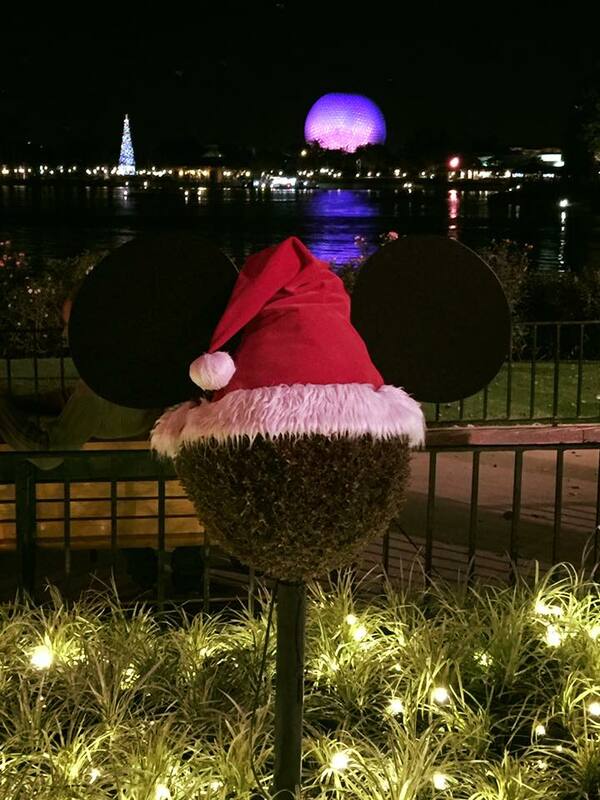 Find yourself face to face with topiary Stitch wearing his Santa hat and tangled in a string of festive lights. He’s also taken a chunk out of the corner of a sign celebrating the Holidays at Epcot. Silly 626. Keep moving past Spaceship Earth and as you head towards the World Showcase, you’ll find Goofy and Donald messing around among more lit Christmas trees. Donald sports a Santa Hat and red bow tie, Goofy wears a plaid festive scarf. This location offers characters and a giant Christmas tree to add more Christmas cheer. Just like with the last photo spot, Goofy and Donald have a buddy at the other end of the landscape. Here you will encounter a snowman made of winter shrubs, complete with top hat, scarf, coal smile and carrot nose. Behind him, a small garden of lit Christmas Trees. This is a great photo location if you want to incorporate the back of Spaceship Earth into your shot. As you actually enter the World Showcase Plaza, the giant Christmas Tree I mentioned previously stands tall with its meticulously decorated ornaments of countries around the world. For a truly Florida Christmas Card this is a great location. The tree and the reflective lagoon are a beautiful combination. Now you are ready to conquer the World Showcase. If you want to incorporate your love of food into your Christmas Card photo experience, choosing the World Showcase is a no brainer. Also, during the holidays, each country brings a little bit of their cultural celebrations to EPCOT. A story teller, which is each countries version of Santa can be found recounting the reason for the season, and providing lessons on how to say Merry Christmas in their native language. This is truly a grand experience if you want to challenge your friends and family to track down each version of Santa and feature that on a Christmas Card. Dare we call it the Santa Shuffle? 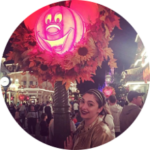 Given there are 11 countries to explore, and none disappoint, I could go on and on about this park but that would take us way past Christmas, so I will save you all some time and cover my top 4 countries with the most festive Christmas décor. 1. United Kingdom: Tucked among the gardens is an English tea set. Its tipped over tea pot branded with an image of a Christmas tree. Truly quaint photo location. 2. Germany: A true Christmas icon, you will find giant life sized nutcrackers to pose with. So grab a stein of hot cocoa and get crackin’. 3. France: Colossal red ornaments are lined up on the streets of France. Here you can have a little bit of Paris in your Christmas Card with the Eiffel tower in the background. 4. American Adventure: Meet Santa, Celebrate Hanukkah and Kwanzaa too. In this area of the World Showcase you will find typical holiday décor that you see in the states. Grab your honey and smooch under the mistletoe as Voices of Liberty serenades guests. Now for those who just want a great spot outside of the hustle and bustle of walking the World Showcase, you can find a great photo opportunity at The Land. Gingerbread houses are constructed to represent Disney resorts and recognizable areas. This is a must see even if it’s not a high priority for a Christmas card shot. The delicious smell of gingerbread alone should be enough to get you over there. Next week, I’ll have rundown of the Holidays at Hollywood Studios and share some information on surrounding properties with great photo locations. See you real soon!